Everything comes to she who waits. That is the case for Newmarket horse trainer Ilka Gansera-Leveque who must be relishing the thought of the new Flat turf season. Based at Saint Wendred's, Newmarket, Suffolk, down Hamilton Road the thoroughbred trainer and practising vet has progressed from an apprentice jockey in her native Germany before an assistant trainer in the US. She completed her British Trainer's Course in 2012. Take a look at her race day successes here. If you wish to keep up with all the latest news, you will enjoy her blog 4:30 am which details all the work that goes into running a successful stable. Frankel Blog is all about featuring Frankel offspring, predominantly the new two-year-olds for the season ahead. So it is with great pleasure we can detail that Ilka has much to look forward with as yet an unnamed bay filly out of the mare Nouriya. The mare was originally in training with Sir Michael Stoute and owned by Saleh Al Homaizi & Imad Al Sagar. In a ten-race career, she achieved three wins including two wins at Listed class. The dual Listed winner Nouriya (Danehill Dancer) produced a filly from the first crop of the Champion Three-Year-Old Australia in early April and is now set for a date with Frankel. She a halfsister to Aljaazi (Shamardal), who finished a creditable tenth in the Gr.1 1,000 Guineas the weekend before last and is the fourth foal of her dam, who is a daughter of Majestic Sakeena (King’s Best) one of the stud’s foundation broodmares. 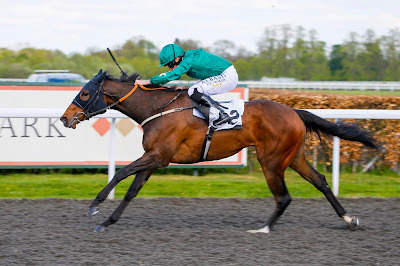 Ilka's two-year-old Frankel prospect is similarly owned by Saleh Al Homaizi & Imad Al Sagar. The April foal is certainly a horse of some repute and considering the sire fee for Frankel is £175,000 you can guarantee this filly will put a spring in the step at Saint Wendred's. Take a look at more Frankel two-year-olds here.